Alex Ovechkin is just two games away from capturing his first Stanley Cup, and he couldn’t have gotten to where he is without some help from “Mamma Luccia’s” restaurant. In a letter to the Players’ Tribune, Capitals defenceman Brooks Orpik revealed that Ovi consumes a massive meal from the restaurant ahead of every home game. A picture of the large portion, which Orpik described as “inspiring” has been revealed and let us tell you: you won’t be disappointed. Take a look at this mountain of chewy goodness. The dish is one thing, but it’s beyond impressive if the Russian actually manages to hammer all of the bread along with it. Orpik explained his captain’s exact meal routine ahead of each game. Can’t exactly blame someone for wanting to take a 5 hour nap after consuming that. 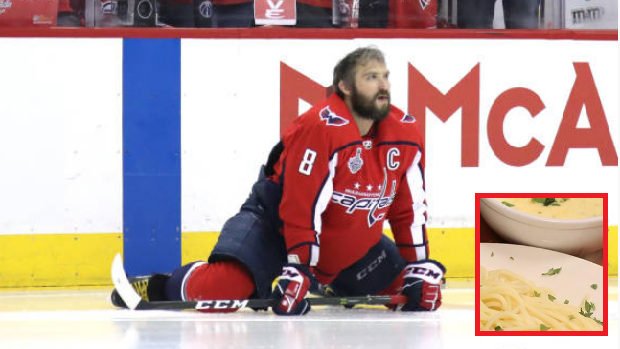 Ovechkin is doing all the right things right now, so he’s best off just sticking to his routine. We’re just wondering how many calories are in the picture.